"I’m glad I went to Derby College as it set me up nicely for going in the army." Viewers of Channel Four’s British Army Girls may well remember former recruit Krystal Treadwell. The ex-Derby College Public Services student was among a group of raw recruits filmed doing their basic training at the army’s Pirbright training centre in Surrey. And as Krystal herself readily admits she had her fair share of share of ups and downs during what was a very demanding 14 weeks. The fly-on-the-wall documentary, aired in April, gave a fascinating insight into what is expected of the recruits as they prepare to pass out – and what it takes to become a British Army soldier. 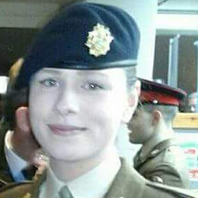 Now an army chef, Krystal, who is from Chaddesden, took further army training after Pirbright and is now preparing to go on a six week tour of duty to Africa – her first overseas tour. And, although she found initial training hard going at times, she is pleased she took the Public Services course at Broomfield before joining up. She especially enjoyed the map reading part of her course, which involved training at Drum Hill near Derby. Krystal found that already having had some navigational experience helped her on army exercises.